You’ve probably seen one of Tactical Firearms’ signs floating around on social media. 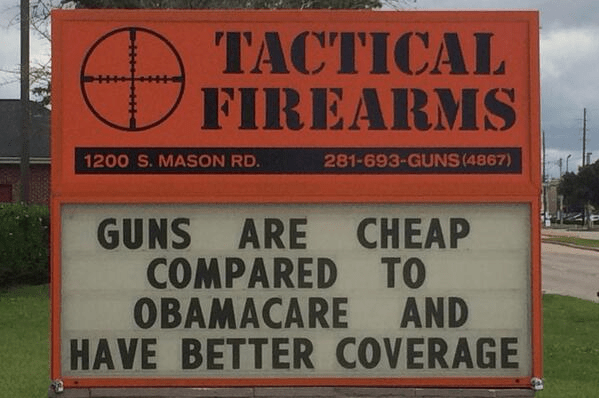 The Texas gun store is famous for their snarky political signs. Here are a few examples. Now, it seems like the shop may be facing some blowback, and the shop is wondering if it’s political in nature. The shop’s bank has called in a loan with (according to Tactical Firearms) a perfect, on time payment record. The move threatens to put Tactical Firearms out of business. The shop sent out the following statement to their newsletter followers, with the allegations against their bank. The following is directly quoted from Tactical Firearms newsletter. Back in 2012 Tactical Firearms purchased the land next to our existing facility. Icon Bank suggested an interim loan at 7% interest and then to refinance all of our loans together into one loan at a lower rate of 3.579%. At that time we had a fixed, long term loan for the building and the construction of the range. By purchasing the land, it cross collateralized the loans and put us in a situation (unknown to us at the time) that could threaten our entire business. When it became time to refinance the loans, one of our owners (30%), Steven Coe Wilson, decided to back out. It is our belief based on what we have since learned that Steven wished to seize control of the company. We have substantial reason to believe he recruited some of our longest and hardest working employees to overbuy, to overspend, and to bury Tactical Firearms in debt to the point that we could not pay our bills. His grand plan appears to have been to swoop in and buy up the loan when the bank foreclosed on us for failure to pay. Perhaps to his disappointment, not only have we successfully paid our loan notes, we have also cut the unpaid bills by over half. Sadly, because Steven did not sign the loan refinance that he had previously agreed to, the short term loan for the land has now matured. By default, our primary business loan is now in jeopardy. Further complicating this situation, it has also been brought to our attention that a member of the board of directors of Icon Bank, Mark Evans, is the owner of a new gun store in the Houston area. Based on what we’ve learned about this competitor, we are convinced that this bank has the intensions of forcing Tactical Firearms out of business to remove a major competitor from the market of Mr. Mark Evans’ new business, Guns Over Texas. If true, we believe this would constitute unfair trade practices in the State of Texas, and we intend to pursue this matter with the office of Texas Attorney General Greg Abbott. Further connections support our accusations of anti-trade practices. For example, Mark Evans is the Managing Partner for Commercial Finance with the firm O’Connor, Craig, Gould & Evans – the firm that is being used by Icon Bank to proceed with the foreclosure. We strongly protest what appears to be a clear conflict of interest on the part of Mark Evans, who appears to be using his influence at the law firm (and therefore the bank) to engage in destructive, punitive actions with the ultimate aim of destroying his competition and thus ensuring the profitability of his own gun store. Such behavior is monopolistic, anti-free-trade and un-American. Please contact the Attorney General and urge him to look into this matter. At the same time, the bank’s excuse to us for calling in the loan is because the “government does not support loans to the gun, alcohol, or hotel industries” and the banks get heavily audited. This is an extension of the Obama administration’s backdoor efforts to bankrupt the firearms industry and all its supporting retailers and firing ranges. Since the government can’t take away our Second Amendment directly, they make it difficult for businesses to stay open by pressuring banks to close loans. This has already happened to other gun shops around the country. We are fighting to make sure it doesn’t happen to us. All these factors seem to now be coalescing into a deliberate, well-planned attack on Tactical Firearms with the aim of permanently putting us out of business. The idea of our doors closing is incredibly painful to even imagine. We have over 30 employees, many of whom have children, who depend on our successful business operations to keep their own homes. In addition to our economic contributions to Katy and the greater Houston area, we also donate our time and profits to charities like Oilfield Helping Hands and Texas Sentinels. Even more, there are 175 NFA items in our possession awaiting approval from the ATF. If we are unable to stay in business, every single one of these items would have to be resubmitted and the year long process would begin again. Today, I am reaching out to YOU, our valued customers and supports, to ask for your help in keeping us out of the clutches of these punitive, monopolistic actions that now threaten Tactical Firearms. THIRD, we ask that you help put out the word that all this could be readily solved if another INVESTOR or LENDER could be identified who would step up to the plate and support this successful business. We are a high-integrity, profitable business with a strong credit history and a perfect record of loan payment. Any lender would be thrilled to do business with a company like Tactical Firearms, and if a lender or investor wishes to help support our operations, it would also be a PROFITABLE venture for them to do so. 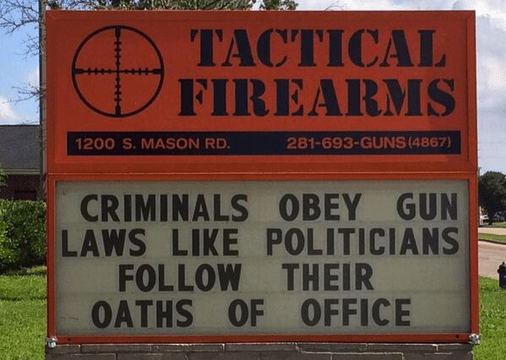 Finally, all of us here at Tactical Firearms thank you for your ongoing support, and please know that we are deeply dedicated to finding solutions that will defend us against this punitive and potentially unlawful attempts to destroy our business. We believe in America. We believe in the Second Amendment. And we also believe that businesses operating in Texas should not be subjected to Gestapo-style tactics from the banking industry and its insiders. What we are fighting for here is the integrity of the entire business infrastructure which obviously depends on lenders to act on good faith when supporting expanding businesses. What this system is trying to do to Tactical Firearms right now is a travesty of justice, and it’s just one more sign of the kind of punitive insanity we are seeing played out across this great nation by a network of anti-American individuals who are attempting to destroy the fabric of this nation one day at a time. We refuse to let that happen, and we will fight this with every ounce of effort and breath within our reach. We thank you for any assistance and help you can offer us in this very trying time. Share this with everyone you know and please keep all of us in your prayers.